This high ride Galco Silhouette holster is constructed of premium saddle leather and features a reinforced thumb break, double-stitched seams and a covered snap that protects your gun's finish. 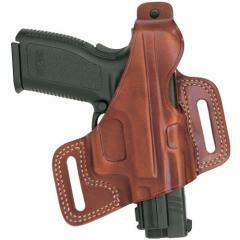 The Galco Silhouette holster is made to fit belts up to 1.75". Perfect fit at a great price Fast shipping. Very nice holster. Fast shipping. Great company to do business with. Fit my Colt Defender great right out of box Fits my 5.5 in. Colt Commander the same. Strap fit for C&L with no problem. Am very pleased with CopsPlus and Galco. Although I was not surprised. Problems I had read were not because of product or service. Silhouette High Ride is a good quality holster. For once I followed the break-in instructions with the zip lock bag and it worked perfectly. Great holster. Keeps the "concealed" part concealed and very well made. Fits close to my body, by design. An excellent holster for it's price. I love it Very easy to conceal and amazing quality. You guys shipped it much much faster the I expected I will definetly be going though CopPlusInc in the future. Got my order in and is exactly what I wanted. Hard to choose a favorite betwween this and the fletch. Galco makes good holsters and this is a nice design. It rides very high and really needs a robust belt or the holster will flop away from the body. So make sure you' ve invested in a good belt if you want to wear this holster. Because it has a snap retention device, it is molded a little looser than it would if it were a friction fit and it required no break in. I am wearing it now under a loose fitting golf shirt with long tails and no one is noticing it. So it conceals well. No regrets, a good product. Doesn't fit mk9 with Crimson trace laser grips but fits my Detonics, nice holster. Excellent Galco product as always. Best holster I own so far.